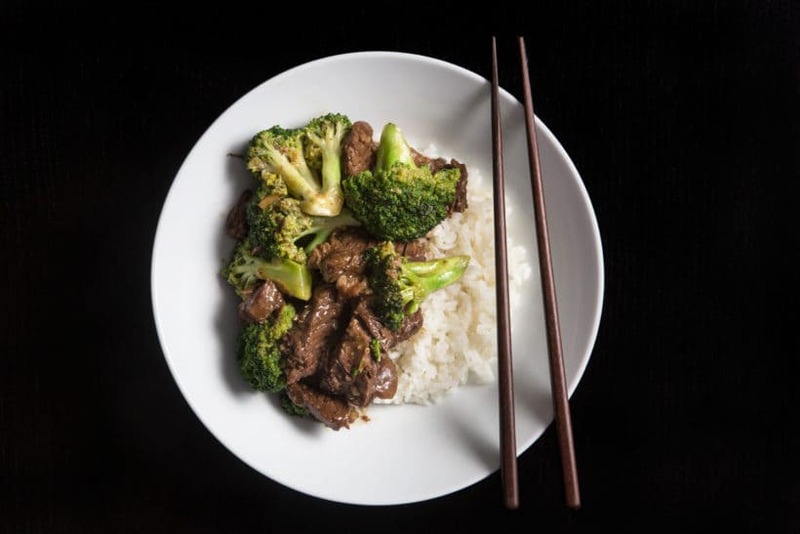 Skip the Chinese takeout and make this Classic Instant Pot Beef and Broccoli Recipe (Pressure Cooker Beef and Broccoli) at the comfort of your home! Crunchy broccoli with tender & juicy beef drowned in deep garlicky fragrance and lingering savory flavors. Comfort food at its best! Yum!! 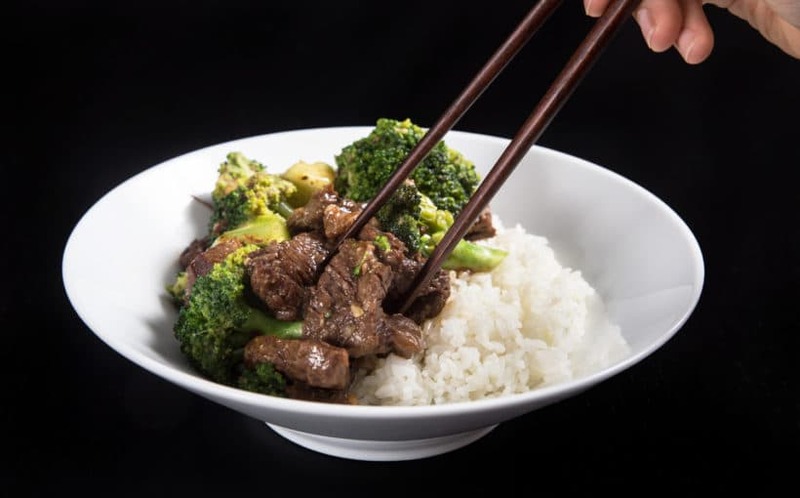 Normally, we use flank steak to make Beef and Broccoli Stir Fry in the wok because it has strong beefy flavors. However, the trade off is it’s a very lean cut of beef with long muscle fibers and little marbled fat. So, we were curious to see how it’ll turn out in the pressure cooker. Many moons ago, we’ve experimented with pressure cooking flank steak in Instant Pot Pressure Cooker. We were sad to find the flank steak meat chewy, tough, and essentially overcooked, even when we only pressure cooked it for only 1 minute with High Pressure. *Pro Tip: Remember it’s critical to pick a well marbled chuck roast. 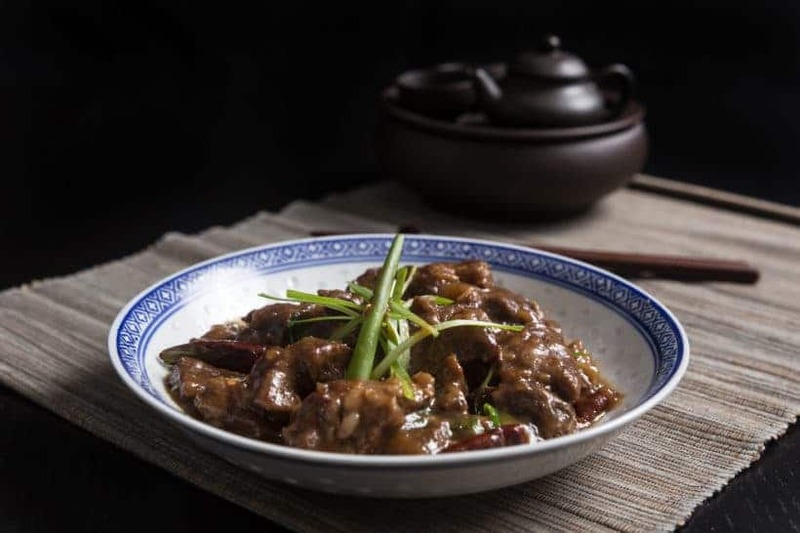 Deliciously comforting Chinese dish that you can easily make at home! While the pressure cooker is heating up, you can prepare the ingredients as indicated. *Pro Tip: You should have about 24 mins including the time for browning the chuck steak. Season one side of chuck steak lightly with kosher salt and freshly ground black pepper. Add 1 tbsp (15ml) peanut oil in pressure cooker. Ensure to coat oil over whole bottom of the pot. Carefully place the seasoned side of chuck steak in pressure cooker. Lightly season the other side with kosher salt and freshly ground black pepper. Brown for 7 mins on each side without constant flipping. Remove and set aside on a chopping board. While the chuck steak is browning in pressure cooker, mix 2 tbsp (30ml) light soy sauce (not low sodium soy sauce), 1 tbsp (15ml) dark soy sauce, ½ tbsp (7.5ml) oyster sauce, 1 tsp five spice powder, ¼ tsp sesame oil, and 1 cup (250ml) unsalted chicken stock in a glass measuring cup. Add diced ginger and minced garlic to the pressure cooker. Sauté for roughly 90 seconds until fragrant. Do not let the garlic burn. Pour in the Chicken Stock Mixture (from Step 4) and completely deglaze bottom of the pot by scrubbing the flavorful brown bits with wooden spoon. Turn off the heat briefly to cut the chuck steak. After deglazing, cut the chuck steak into ⅛ inch thick beef slices. *Pro Tip: Since chuck roast grains run in different directions, slice it against the grain the best you can. Place beef slices and the flavorful meat juice in pressure cooker. Make sure all beef slices are partially submerged in the cooking liquid. Optional Step to Make Pot-in-Pot Rice: Layer a stainless steel bowl filled with 1 cup (230g) of Jasmine rice on top of a steamer rack. Add 1 cup (250ml) cold water in the rice bowl. Make sure all the rice is covered with water. Turn off the heat. Open the lid carefully. Press Cancel button, then Sauté button to heat up the sauce. In a small mixing bowl, mix cornstarch with water. Mix it in one third at a time until desired thickness. While the sauce is boiling, partially submerge the broccoli florets in the sauce mixture in pressure cooker. Turn off the heat by pressing Cancel Button, then switch to keep warm mode by pressing Keep Warm Button. Close the lid immediately (with venting knob in venting position). Wait 3 – 3.5 minutes before opening the lid again. The broccoli should be cooked by then. If not, give it a few quick stirs. Taste and adjust the seasoning with more five spice powder, kosher salt and brown sugar if necessary. 1. Why are we browning the chuck steak as a whole before cutting it up? Retain More Moisture: Browning the chuck steak as a whole retains more moisture due to less surface area. 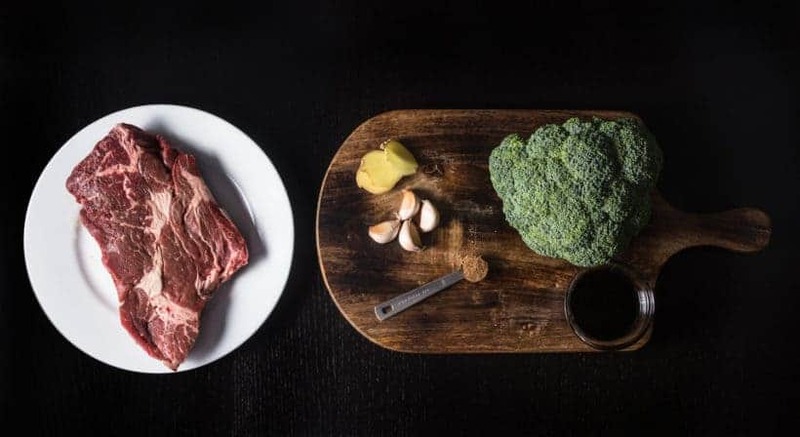 Brown Faster & Better: Since maillard reaction excels in a dry and high heat environment, the chuck steak will brown faster and better compared to cubed stew. Richer & Flavorful: The caramelized flavors from browning results in a richer & more flavorful dish. 2. Can I use other beef cuts for this recipe? Chuck roast is one of the most suitable cuts for pressure cooking. For optimal result, choose one that is well marbled!! 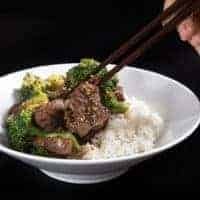 Skip the Chinese takeout & make this Classic Instant Pot Beef and Broccoli Recipe (Pressure Cooker Beef and Broccoli) at the ease of your home! Tender, garlicky beef with crunchy broccoli is comfort food at its best. Yum!! 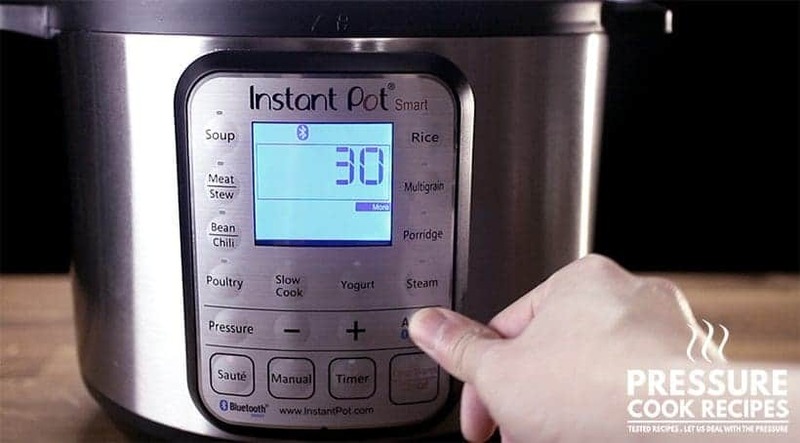 Prepare Pressure Cooker: Heat up your pressure cooker over medium high heat (Instant Pot: press Sauté button and click Adjust button to go to Sauté More function). Make sure your pot is as hot as it can be (Instant Pot: wait until the indicator says HOT). Prep Ingredients: While the pressure cooker is heating up, you can prepare the ingredients as indicated. You should have about 24 mins including the time for browning the chuck steak. Brown Chuck Steak: Season one side of chuck steak lightly with kosher salt and freshly ground black pepper. Add 1 tbsp (15ml) peanut oil in pressure cooker. Ensure to coat oil over whole bottom of the pot. Carefully place the seasoned side of chuck steak in pressure cooker. Lightly season the other side with kosher salt and freshly ground black pepper. Brown for 7 mins on each side without constant flipping. Remove and set aside on a chopping board. Make Chicken Stock Mixture: While the chuck steak is browning in pressure cooker, mix 2 tbsp (30ml) light soy sauce, 1 tbsp (15ml) dark soy sauce, ½ tbsp (7.5ml) oyster sauce, 1 tsp five spice powder, ¼ tsp sesame oil, and 1 cup (250ml) unsalted chicken stock in a glass measuring cup. Sauté Ginger & Garlic: Add diced ginger and minced garlic to the pressure cooker. Sauté for roughly 90 seconds until fragrant. Do not let the garlic burn. Deglaze: Pour in the Chicken Stock Mixture (from Step 4) and completely deglaze bottom of the pot by scrubbing the flavorful brown bits with wooden spoon. Turn off the heat briefly to cut the chuck steak. Cut Chuck Steak: After deglazing, cut the chuck steak into ⅛ inch thick beef slices. Since chuck roast grains run in different directions, slice it against the grain the best you can. Place beef slices and the flavorful meat juice in pressure cooker. Make sure all beef slices are partially submerged in the cooking liquid. Optional Step - Make Pot-in-Pot Rice: Layer a stainless steel bowl filled with 1 cup (230g) of Jasmine rice on top of a steamer rack. Add 1 cup (250ml) cold water in the rice bowl. Make sure all the rice is covered with water. 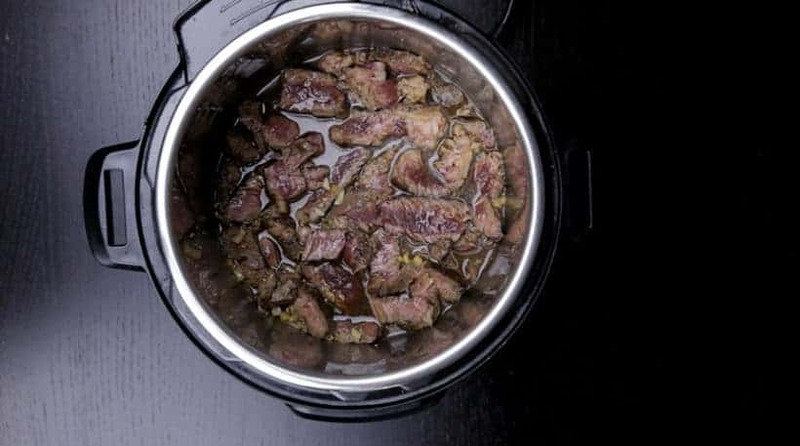 Pressure Cook Beef Slices: Close lid and pressure cook at High Pressure for 12 minutes + 12 minutes Natural Release (after pressure cooker has finished cooking, wait 12 minutes then carefully release the remaining pressure). Turn off the heat. Open the lid carefully. Thicken Sauce: Press Cancel button, then Sauté button to heat up the sauce. In a small mixing bowl, mix cornstarch with water. Mix it in one third at a time until desired thickness. 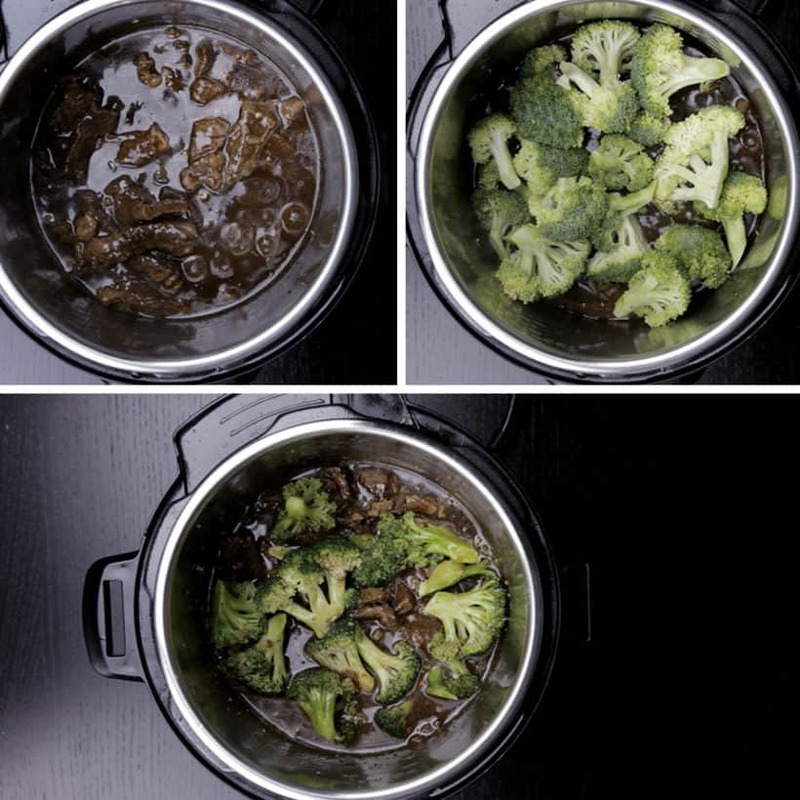 Cook Broccoli: While the sauce is boiling, partially submerge the broccoli florets in the sauce mixture in pressure cooker. Turn off the heat by pressing Cancel Button, then switch to keep warm mode by pressing Keep Warm Button. Close the lid immediately (with venting knob in venting position). Wait 3 - 3.5 minutes before opening the lid again. The broccoli should be cooked by then. If not, give it a few quick stirs. Taste and adjust the seasoning with more five spice powder, kosher salt and brown sugar if necessary. 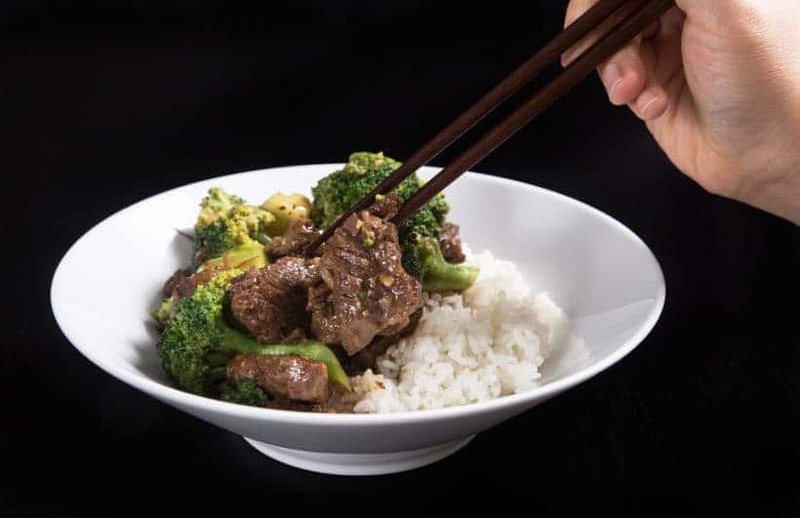 Serve: Serve Beef & Broccoli immediately with jasmine rice or other main & side dishes. Can I use beef flank steak instead? Do I still need to brown the whole piece first? Will cooking time change? Yes, I recommend browning the beef flank as a whole first. It will take 5 minutes and 8 minutes natural release for beef flank slices. This is the best pressure cooker recipe I’ve ever made. The meat just melted in our mouths. Awesome! How can I double the recipe? You will want to increase the spice and seasoning by 25%. This was exactly as it should taste!!! Perfect! So good! The whole family loved it and I have just enough left for lunch tomorrow. I used only 1 lb of beef, but kept everything else the same. Thank you so much for the love and support throughout the years!! Recipe sounds wonderful but I am on low-salt diet for kidney disease, how do I reduce the sodium? Thank you for your question. You can skip the oyster sauce, dark soy sauce and use low sodium soy sauce as light soy sauce. I made this recipe tonight. Followed recipe to the letter in my Mealthy Multi Pot. Everyone enjoyed it. The flavors were quite unique. I am looking forward to seeing the Americanized version! Thank you for this recipe! Thank you so much for your kind words and honest feedback on the recipe! Amazing! This was my first IP recipe. Couldn’t have picked a better way to convince my husband we needed a second IP for our river place. One dinner did that, and he is not an easy sell when it comes to my cooking ‘appliances’! Look forward to trying EVery one of your recipes! Looking forward to seeing what you make next. Made this for dinner tonight & this recipe is another winner, Jacky & Amy!! So many things to love: 1) it’s not oily like the traditional beef and broccoli at restaurants 2) the steak came out incredibly tender! I was worried because mine looked a little medium-well after searing, but the IP is magic!! 3) I loved that the broccoli was still a bit crunchy and not soggy! Thank you so much for your kind words and support throughout the years! Had top sirloin and broccoli on hand and wanted to make beef with broccoli for dinner. I of course did not have all of the ingredients on hand so had to make substations (like no oyster sauce, but had fish sauce; and only 1 type of soy sauce in the house; and no five spice on hand, or anise, so used a bit of cinnamon and ground ginger). We enjoyed it. Now I am going to have to go shopping for the rest of the ingredients so I can make it again and see how it is really supposed to turn out. Will wait to rate it until I make the recipe as written. Can i use just any stainless bowl? Or it has to be a proper one? Any stainless steel bowl will work. Try looking for one that has a wide bottom. Welcome to our site and thank you so much for your kind words Kristy 🙂 ! I made this tonight and it was absolutely delicious! I served it with mashed cauliflower. Yum! I had a question regarding step 10 (cooking broccoli). I added my broccoli and hit cancel. I have an Ultra and did not see a “keep warm” button so I hit the “warm” button for 6.5 minutes which did not make the broccoli tender. I switched gears and pressured cooked it for 3 minutes however during that process the “burn” message came on. I hit cancel and released pressure right away. In the end, the broccoli actually came out perfectly crunchy, the meat tender and the dish was delicious but I know this was a fluke. What should I do next time? I have a question. Was the sauce boiling when you hit the cancel button and was the lid closed? The heat from that should be able to steam cook the broccoli. Hi Amy and Jacky. I was looking for a beef and broccoli pressure cooker recipe and your site popped up. Am I glad that it did. I made your recipe and what can I say but delicious. My whole family devoured it. I have made this recipe and a few more and am looking forward to making even more. Your simple instructions, pictures and the best videos make the task so simple to follow. 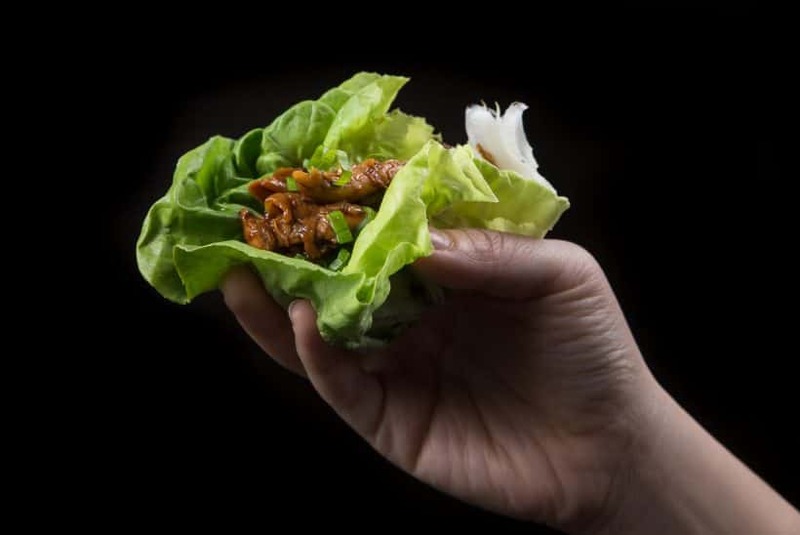 I have subscribed to your site for more delicious recipes. Thank you for sharing your recipes. They have made my life so much simpler when it comes to cooking. I made this easy to follow recipe and the results were fantastic and the ribs and rice perfectly cooked. Next time I cook this I will increase the rice to 2 cups as the proportion of rice is a bit low for the amount of ribs. Otherwise, perfect and definitely for keeps. 8 inch stainless steel bowl will fit. Is it ok to substitute rib eye steak instead of chuck roast? If not, do you have recipes that use rib eye? Rib eye steak is a very tender cut, so I would recommend cooking it on the the stovetop and finish in the oven. We followed the recipe to the letter — but it was too salty. I wonder if doing the brown sugar would have helped (or gone to more dark soy sauce than light). The beef was amazingly tender, and this was the first time I did the pot-in-pot for the rice and it worked great! I did cover the rice, but wasn’t sure if it was required or not. It could be the batch of light soy sauce is more salty than ours. Please always taste and adjust accordingly! Thank you for sharing your recipes and wealth of knowledge. I am looking forward to trying your recipes! 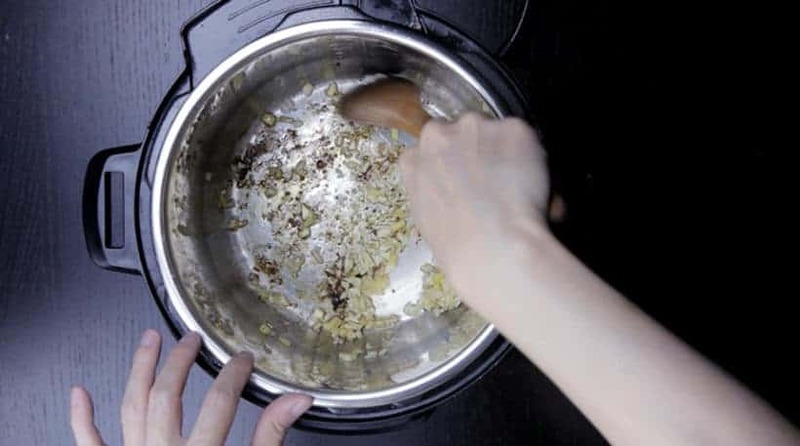 I have a question about the bowl in bowl method of cooking. I just received a Fagor 8 qt. 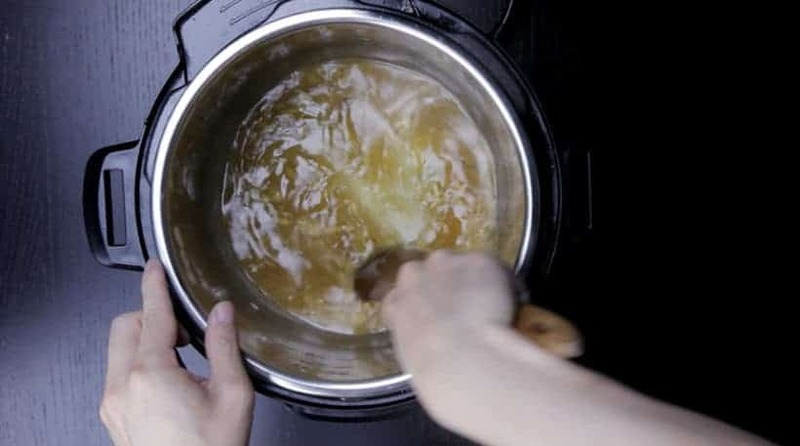 electric pressure cooker/multi pot, and I would love to try this recipe. However, my instruction manual very clearly states that the pot should not be overfilled past the fill line (I think it’s 2/3 full.) Does that apply to the bowl in bowl cooking method, or will it work because air can still get around the stainless steel bowl? It doesn’t apply to the bowl in bowl cooking method (Pot in Pot) as the food inside the bowl will not become as foamy. If I am going to use beef round eye instead, to cut down on some of the fat, how do you suggest I adjust the recipe and cooking time? 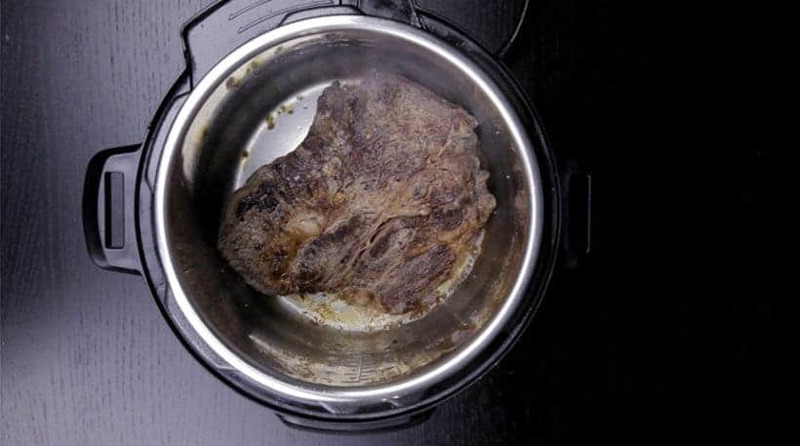 Lean beef can become tough and dried in the pressure cooker if overcooked. I would slice the beef round eye thinly against the grain. It will only take a few minutes if you just saute the thinly sliced beef. This recipe was way too bland! We used the chuck roast that you recommended vs flank steak… it literally tasted like a roast with 5 seasoning. It had a very weird taste! No one in my family liked it. I will say that your instruction for the IP was useful, but I would not make this recipe again. Sorry! Thank you so much for your feedback on the recipe. May I know if Low sodium soy sauce was used instead of Chinese Light Soy sauce? Was any substitution made to the recipe or followed to the T.
It will be helpful for us to failproof this recipe. I normally love your recipes, but this one did not work for us at all. Our chuck slices fell apart and we ended up with a pile of shredded meat in a gravy that tasted like roast gravy with an aggressive amount of 5 spice. I followed the recipe as it was written and cooked rice PIP above the meat. I still have 5 spice coming out of my nose when I breathe. Haha. I appreciate the work and care you put into your recipes, and as I said, this was a first fault for us using one of your recipe. The flavor of this recipe resembles the China/HK version more than the American version. I am thinking this is the reason why some people enjoyed the flavor and some don’t. We will probably create an American version in the future!! Will recipes, cooking instructions, and times work on cookers made by different manufacturers? I have a magic chef brand, got it as a Christmas gift and hoping to use some of your recipes and cooking instructions. Thank you for your time and consideration. Happy New Year! We cannot use peanut oil, could you recommend a different oil? I’m trying this tonight; but could not find “light” soy sauce. Would I just just more of the dark? Dark soy sauce works differently as it’s richer, thicker, less salty with slight sweetness. Have fun making the Beef and Broccoli! Hi guys I only managed to purchase 2 slices of 1 inch chuck roasts. I will brown them separately, but do I need to adjust the cooking time? Thanks! Hope you are doing well this week. No need to adjust the cooking time if you are cutting the chuck roasts into ⅛ inch thick beef slices in step 7. What type of stainless steel bowl do you put in to cook the rice? We bought ours at Daiso and you can probably find them in local Asian supermarkets as the pot-in-pot method is quite popular in Asia. Any food grade (304 or 316 or 18/8 18/10) stainless steel bowl that fits into the IP (less than 7.5” in diameter) will work. They are also called Tiffin in Indian markets. Way too bland for me. Bland usually means it needs more salt to open up the flavor. Can you substitute the white jasmine rice for brown basmati rice? What is the brown rice to water ratio for pot in pot? For this recipe, the time is a little too short for brown basmati rice. This recipe has the proper ratio. Wow, I mixed 2 tbsp of water with 2 tbsp of cornstarch and got a thick gel before I could even get close to putting it in the pot. I’ve never had this happen before. Is it really 1 to 1 ratio? Yes, it is 2 tbsp cornstarch + 2 – 3 tbsp of water. You want it to be a concentrated mixture when adding it as a thickener. 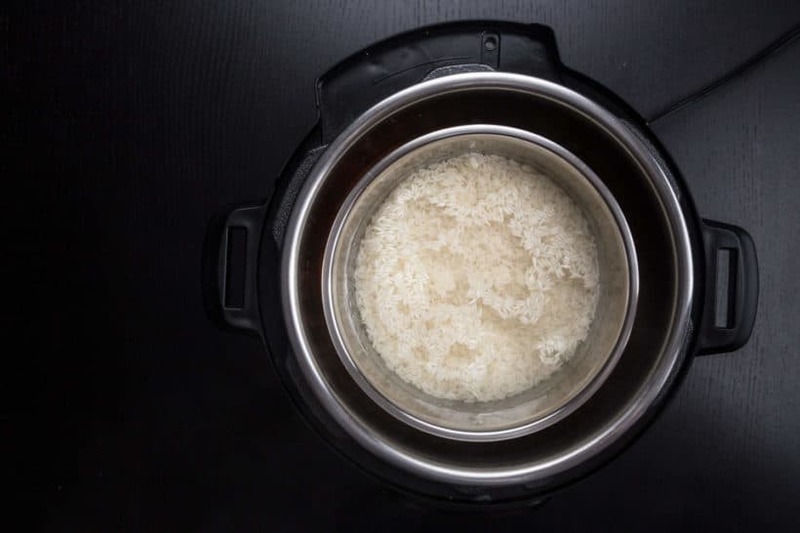 Another question: Is the jasmine rice (rinsed, of course) soaked for some amount of time before it is cooked in the Instant Pot? No need to soak in the Instant Pot as the high pressure will take care of things! I want to get this straight. The rice is cooked ABOVE the beef and sauce in the pot? Then the rice bowl and rack are removed before thickening the sauce and putting in the broccoli? Or am I missing something? Thank you, it sounds delicious. Yes, you got all the steps correct!! My husband doesn’t eat beef so I’d like to substitute pork. What cut would work for this dish. Thanks.